Crochet heart patterns are always a popular choice at Valentine's Day. You can make small motifs and hand them out to everyone you like. You can turn crochet hearts into pillows, gift bags, and bunting. Crochet hearts dress up blankets and accessories. 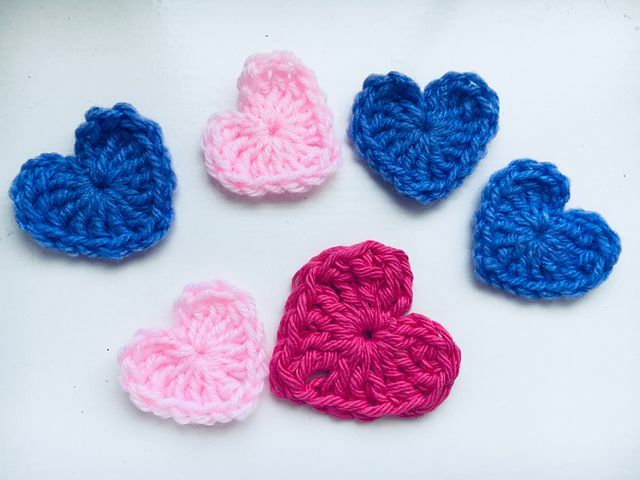 Of course, it doesn't have to be February 14th for you to enjoy making and sharing crochet hearts; many of these crochet patterns can be used year round. Let's start with the easiest, quickest crochet heart pattern out there. This simple pattern is worked up in one basic round. It uses very little yarn so it is perfect for stash busting. Use these crochet hearts as appliqués on other projects including greeting cards. They can also replace confetti on the inside of cards. Use this free crochet pattern to learn how to make a crochet heart square that can be used in a variety of different projects. The project itself is a baby blanket made by alternating the heart square with a checkerboard square. Changing up the yarn in each square creates a candy-colored crochet blanket that is perfect for baby's first Valentine's Day - or any other time of year. This is also a good lapghan gift for the elderly and people in hospitals. This crochet heart is based on the design of the classic crochet granny square. The basic heart is worked in five rounds, and the designer has shared detailed photos to help you see every step. You make two hearts and stitch them together with stuffing in the center to create a toy or ornament that is perfect for gifting. This free crochet pattern uses the waistcoat stitch to create two different types of hearts in one colorful design. There are sprinkles of small hearts topping off the hat, just below the fun pom pom. Then there is a big heart at the center of the design. This one is an advanced crochet pattern but one that's well worth taking on the challenge. Snakes Crochet Heart by Iris F.
Two snakes come together as one to create a heart with their tales. This can be a cute gift to tell someone that "we belong together". This crochet pattern is offered as a video tutorial. This small crochet heart appliqué uses a variation on the corner-to-corner crochet stitch to create a heart with a top that looks a little bit like a bow. This is perfect for gifting; add a magnet or pin back to turn it into a simple gift. 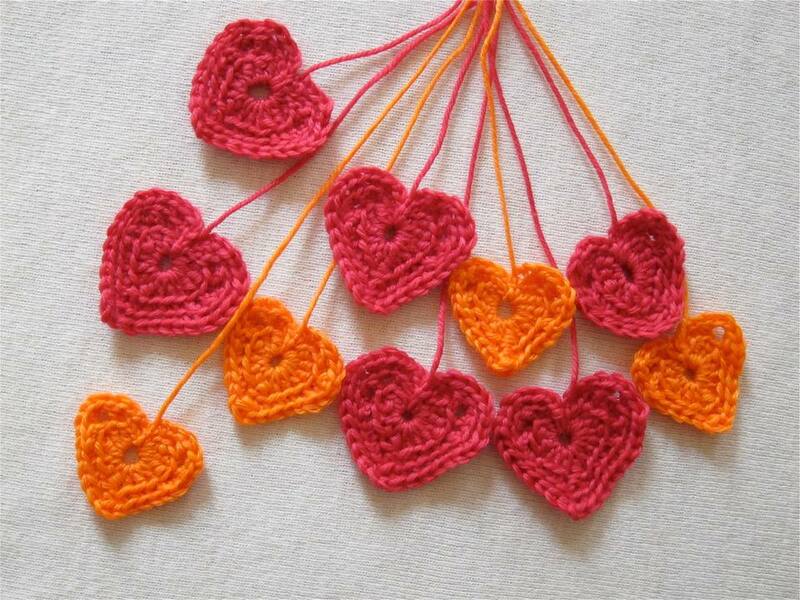 Use different yarn weights to create hearts of varying size. Rows of crochet hearts create a blanket that will remind someone of how much you love them. The instructions include sizing information for everything from cribs to king size beds. The pattern also includes a photo tutorial for the five row repeat that makes up the hearts. Change colors at every repeat to make a more colorful variation on this design. This crochet pattern shows you how to make a simple heart. More importantly, it shows you how to string a set of these hearts together to create bunting. This is perfect decor for a Valentine's Day party. Heart bunting can also decorate a nursery or kitchen in any season. Make tall crochet squares that have hearts in the center of them and join those squares together to create a cute, cozy cowl. This pattern alternates the heart squares with other colorful squares, giving you lots of options for creating mix-and-match cowls. The heart is the star of this crochet pillow. It is highlighted by the same-color pom poms added to the corners of the cushion. This pattern comes with a graph as well as a video tutorial that shows you step-by-step how to change colors in crochet. Beginners will find it easy to learn how to crochet a heart using these instructions. Worked up with a size M crochet hook and bulky roving yarn, this is a home decor or gift item that can be created last-minute.